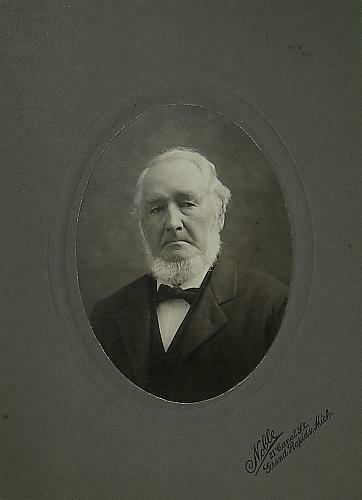 Photograph of Erastus U. Knapp with white hair and beard approximately eighty years old. Title by cataloger. Written next to photograph on the scrapbook page: "E U Knapp 1849 ff; It was on his property that the first school was built on the corner of Fuller and Knapp. He was on the first school board." Knapp arrived here from Oswego County, NY around 1847 and established his farm in Section 17 according to Baxter's History, pg.512. He died May 15, 1905 and is buried in Fairplains Cemetery. Date of photograph estimated from the time T. F. Noble was located at 21 Canal St. (1898-1910) and Knapp's death in 1905.